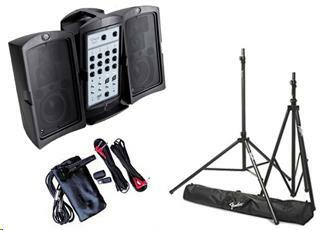 Everything you need in a portable PA system! Looking for an easy to use, full-featured PA with lots of power? Need something compact, portable, and lightweight for easy load-in and transport? Look no further. Fender's Passport Sound System will help you be heard, anywhere you want to take it. 3- XLR and 1/4 in. mic/line channels for vocals, guitars, and keyboards, plus a mono/stereo TRS and RCA channel for DJ turntables, CD players, or most any audio input device. Unit comes with 1 corded microphone, 2 speakers with stands and an ipod cord. * Please call us for any questions on our pa system 150w fender rentals in Eastlake OH.